Caption - The 60 cm gauge Perus Pirapora Railway near São Paulo in Brazil had quite a large and varied fleet of locos for its 19 km long line which was operated by the Cia. Basiliero de Cimento. 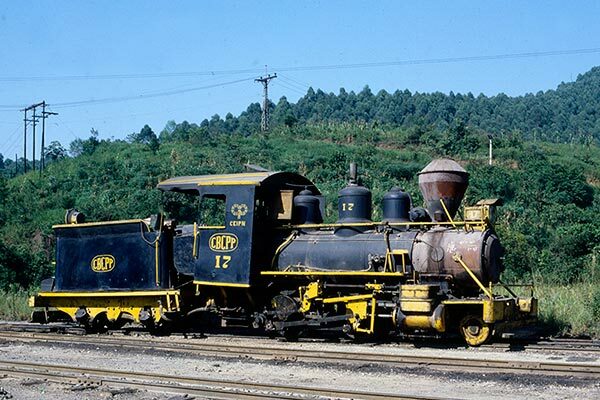 2-4-0 no.17 was built by Baldwin (37399/1911) and was purchased from the Cantareira Tramway which ran a commuter service north from São Paulo Luz station. Sadly, the railway operation at Perus Cement Works ended in 1983 with no.17 (pictured) working the last train.